One action that is, on the surface, completely unrelated to another action, causes the start of a wave of behaviors that can ultimately change your financial life. I started to think about the domino effect when I realized another seemingly unrelated chain of events had created another type of change in my life. When I drank alcohol, I almost never took night classes or did anything in the evenings because I was so tired and rarely had the motivation. Shortly after I stopped drinking (domino 1), I decided to start taking evening yoga classes (domino 2). I wanted to become more flexible for running. I started taking classes in September, and I faithfully go every Monday evening. While I’m there, I look over at the far window, where there’s a small framed sign that says “Be Kind” (domino 3). A couple of weeks ago, I decided, after listening to a podcast on eliminating complaints from your life (domino 4), that I wanted to do something similar, but in reverse. My goal would be to respond kindly. The podcast suggested wearing a bracelet, so I found a silver bangle, and put it on, changing it from hand to hand when I don’t respond with kindness (domino 5), mentally patting myself on the back when I do. I’m with the kids a lot, so this goal helps me to think before I yell about being late for school. It doesn’t always work, and I yell or respond in anger a lot. But I’m slowly getting better, and changing my behavior. One of the more hopeful stats that I heard in the podcast, believe it or not, was, “It takes people an average of 8 months to go one month without complaining.” Behavior change is slow, so it’s okay if I’m not great at it in the beginning. Being more patient with these guys is a worthy goal! One of my goals this year is to improve my communication style, and for me, that means being more patient and responding more lovingly. Or at least develop awareness when I’m not doing that, so I can improve next time. While kindness is a goal, and it’s great that I’m developing more of it, I really noticed that changes in our financial behavior create a wave of benefits. What are the financial dominoes that got us to where we are today, debt-free (except for our mortgage), with a growing net worth, and on our way to location independence? It started with a layoff. Mr. ThreeYear was laid off, I wasn’t working, and Junior ThreeYear was only seven months old. Domino 1. I found Dave Ramsey’s Total Money Makeover and brought it home. Domino 2. We spent the next eighteen months taking every spare dime, applying every gift, selling our cars, and cutting out all unnecessary expenses, to pay off our debt. Domino 3. Mr. ThreeYear started to look for more stable jobs, and interviewed with a company in New Hampshire. Domino 4. 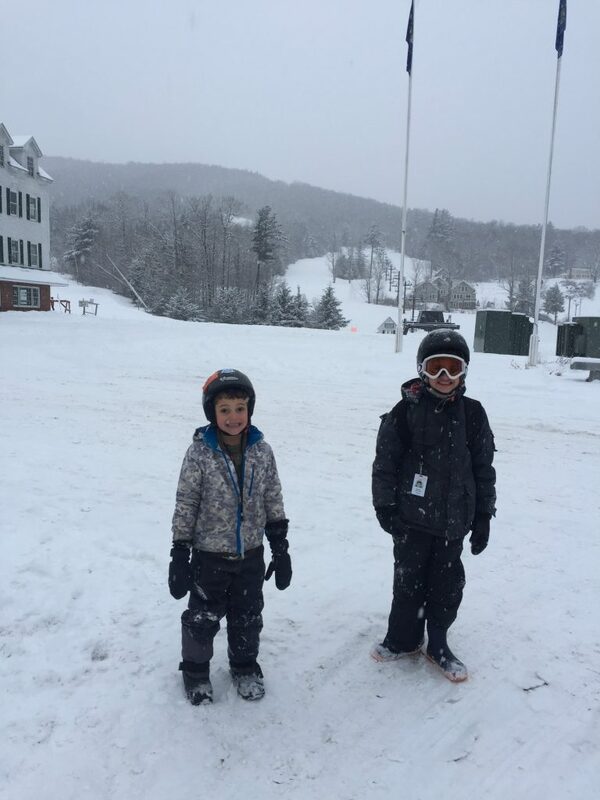 We sold our house at a loss, packed up our belongings, and moved our family to New Hampshire. Domino 5. We rented a house for two years in New Hampshire, put our retirement savings on hold, and saved as much money as we could for a downpayment on a new house. Domino 6. 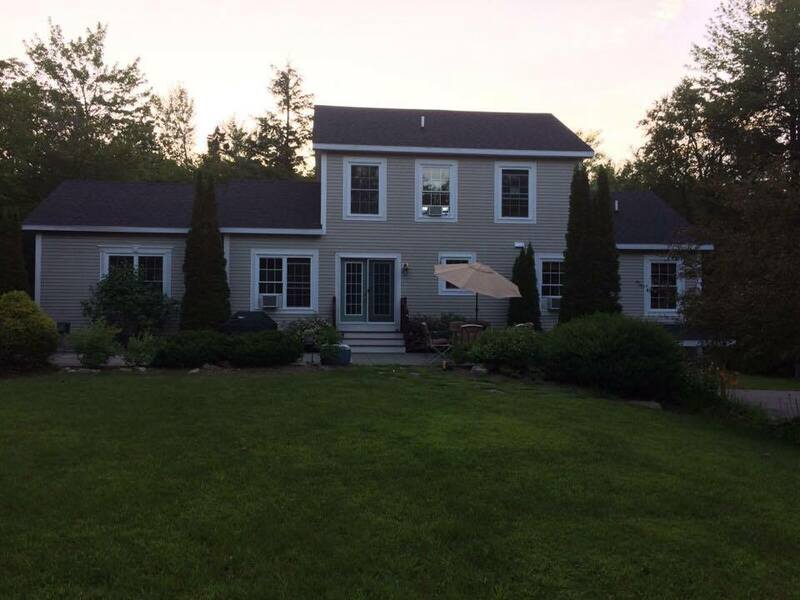 We bought a short-sale home in New Hampshire with a fifteen year mortgage. Domino 7. I started to track our net worth. Domino 8. We spent the next two years building our 401K contributions to the max and saving as much as we could. Domino 9. I started working part-time and we saved a large portion of my income. Domino 10. I started to track our spending. Domino 11. We hatched a plan to double our net worth and become location independent. Domino 12. We paid off our car loans and apartment in Chile and freed up a big chunk of income to add to our savings each month. Domino 13. We started to spend less on groceries each month. Domino 14. When you change one small habit in your life, you don’t expect it to have far-reaching effects. But it does, for good or for bad. Those small habits affect your life in ways you didn’t see coming. Now, we can’t imagine not maxing out our 401K, tracking our spending, or increasing our net worth substantially from year to year, but those were all small changes that seemed insignificant at the time. It’s much easier to look back on our choices and see the connection of our line of dominoes falling into place, one after another. When you’re in the midst of paying off debt, increasing your 401K contributions, or even saving an extra $50 a month, you can’t see the effect those choices will have on your overall life. We saved up for two years to buy our short-sale home. But those choices WILL have an effect. You may feel light years away from your goal. Maybe you’re in debt, maybe you are chained to your job because you use all your income, every cent, on paying your bills. I understand, because we were there. Our family was in that situation, too. But those little choices DO matter. They’re everything when you’re first starting off. Investing $50 a month into a retirement account, faithfully, month over month, may not grow to a huge retirement nest egg, but it will show you that you can save. It will open your eyes to the power of compound interest, as you watch your money grow. It will affect your spending in other areas (“If I can cut another $50 in my grocery budget, I could double what I save for retirement!”). So when you consider implementing a new financial habit in your life, like tracking your spending, remember: it may create a wave of new behaviors in your life that create more results than you could have possibly imagined! 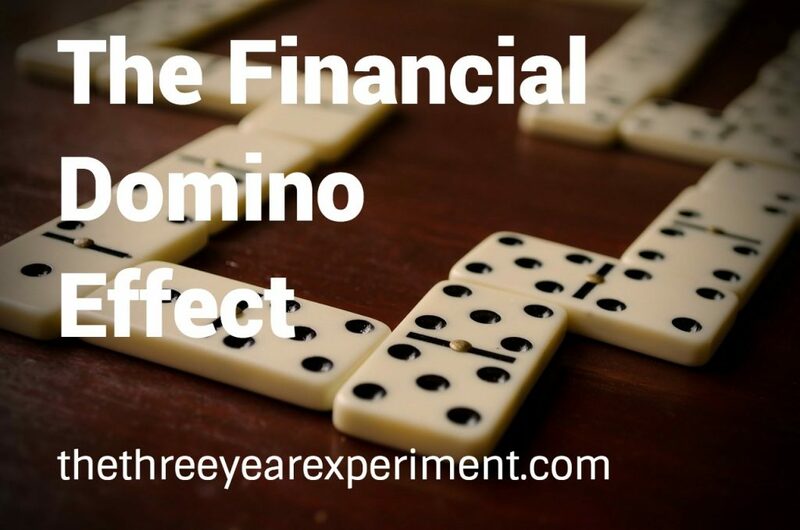 Do you have a “financial domino” story? What are some of the positive results of changing a seemingly insignificant habit? Great post Laurie! I too have domino stories, from a physical and monetary perspective. Both sets of dominoes resulted in losing 28 pounds over the last year and tripling my net worth over the last 2 years. Both started with small decisons, but the impending dominoes toppled over one by one. The future is bright…consider each dominoe as a baby step. I’m excited to see where I end up in 30 years! Yes, when I look back I see many financial domino moments (some negative ones initially) and then the positive ones when I figured things out. Packing our lunches, no longer eating out, selling our newer vehicles for older ones, eliminating non-mortgage debt, etc. It’s amazing the beautiful effect the first domino can cause. Good point about the negative domino moments. We had some of those as well that took us in the wrong direction. No longer eating out has been a big one for us (or, not eating out as much!). It’s amazing how much $$ it frees up, and we really don’t even notice the change! I think the most powerful moment in that first domino is when you decide. That powerful moment of decision is really the impetus that starts the entire domino chain. It is an interesting point of view and fits my financial story as well. Many events fit in well with the grander scheme of things : Getting a raise, renting out garages (who does such a thing? ), slowing down the alcohol consumption (but absolutely not removing it in my case ;)), starting small with investing,… All those dominoes lead to greater things that we may not realize were possible, but we just needed to start with that one domino. And like Amy above, there were some negative domino moments too. Since I am in the personal finance space as well I have now shifted to a more conscious long-term plan but the domino analogy still fits with the “baby steps” approach. Let´s keep on pushing those dominoes! Yes, you’re right–dominoes and baby steps have a lot in common. Renting out your garage? That’s a great idea!! Also, sometimes starting small like you said gives you the courage to try something new and see if it works out. Some things do, some don’t, and that’s ok. Taking (calculated) risks can definitely help speed up the dominoes!